* Please note that this download requires access to a high speed internet connection. 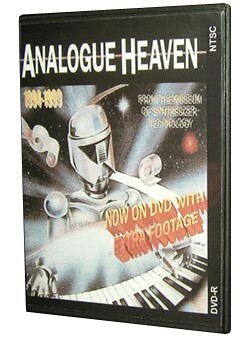 UK-produced video made in the 1990s based around the Museum of Synthesizer Technology. Re-mastered onto DVD (though sadly adding a good deal of ‘analog quality' during the transfer), the two main features are the original 1 hour movie complete with an interview with the late Bob Moog at the opening ceremony of the museum in 1994, and footage shot four years later when the ‘museum' had effectively become a vintage-instrument recording studio. The original movie spotlights some of the museum's star turns including Moog System 3, Buchla System 3, ARP 2600, EMS Synthi 100, Yamaha CS80, Roland VP-330, Moog MemoryMoog, PPG Wave 2.3, Wasp, and Elka Synthex. The later footage also explores Polyfusion, Roland System 700, and others. If you're a geek you'll be in (analog) heaven for sure. The film quality may not up to the original but the instruments and their various aficionado demonstrators remain as colorful and nuttily fanatic as ever. If you have terminal vintage synth-itis, then two subsequent DVDs offer behind-the-scenes footage that was not released at the time but that offers rare insight into the workings of instruments – and now, regrettably an institution – that is long gone. Please contact info@keyfax.com for any DVD support issues or questions.